In June, we gave you guys a BIG taste of the foods that I grew up with – a.k.a. barbecue barbecue barbecue. 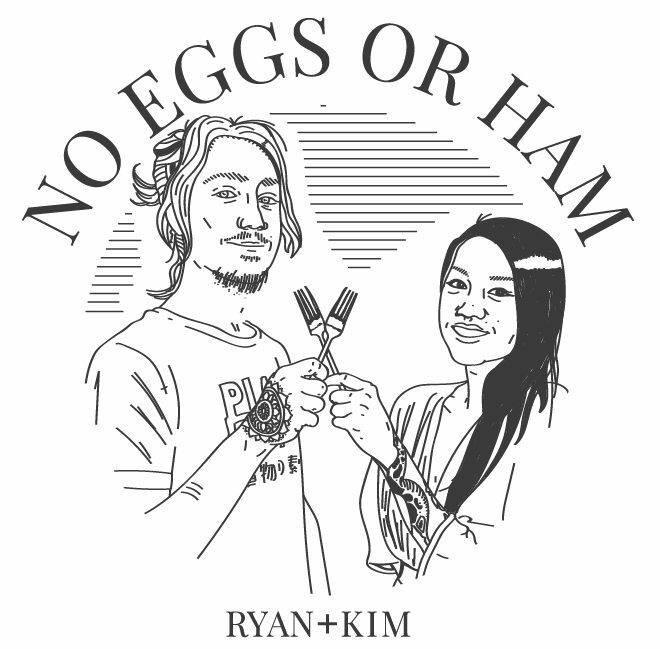 This month we’re diving into the foods that infatuated Kim’s heart as a kid – namely, all the Vietnamese dishes her Grandma made. You might be thinking, “her grandma made vegan jackfruit wings? ?” The answer’s definitely a no, although they definitely ate ripe jackfruit as a tropical treat. WHAT THEY DID EAT however was fried chicken wings tossed in a mixture of fish sauce and sugar or honey. I’d never heard of such a thing until Kim described it to me a couple of weeks ago – according to her word, they’re crispy, heavily salted (that’s fish sauce, for ya), and slightly sweet. We went searching about on Google to try and find such a recipe but couldn’t find ANYTHING. As it turns out, this seems to just be a delicacy among her family, and that’s cool too. As you can probably tell, some substitutions are in order. And by that I mean we’ve got to substitute everything. Jackfruit is sturdy enough to be fried without falling apart, it’s a whole food, and it’s neutral in flavor meaning it absorbs the flavor of marinades and sauces beautifully. As for the fish sauce, which is a key ingredient here, we replace it with… guess what…. go ahead, guess… vegan fish sauce! Wow, who would’ve thought. You can purchase vegan fish sauce at a local Oriental market or you can make your own. Then, we have the substitution we’re most excited for: vegan AND sugar-free “honey.” Obviously it doesn’t come from bees – it comes from synthetic, robotic bees that naturally secrete sugar-free honey. Okay, I’m just kidding – that’d be super weird. This “honey” is essentially a honey flavored xylitol syrup, with a color and consistency akin to real honey. We found this product via our friend Theresa from Health Garden, whom we met at Eat. Drink. Vegan., where she blew our minds with this xylitol honey. There’s two major brands that sell this stuff – Nature’s Hollow and Health Garden, both of which can be found online. Marinated young jackfruit, fried until crispy & tossed with a light, salty glaze. Simple flavors, big punch. In a cake pan or casserole dish, whisk together tamari, vinegar, xylitol honey, and sesame oil. Add in drained jackfruit and move around to coat. Allow jackfruit to marinate for 10 min on one side, flip, and marinate for another 10 min. If you have extra time, let it marinate for even longer. Add starch to a large bowl, add in jackfruit pieces, shaking off excess marinade before they go in. Shake and toss around to coat jackfruit evenly. Add 2 cups of oil to a medium-large sauté pan (10-12 in) over medium heat. Heat up to roughly 350° F; the oil should shimmer, sizzle if food’s dropped in, but not be smoking. While oil heats up, melt buttery coconut oil in a small pot over medium heat. Once hot, toss in garlic and cook until lightly browned; about 1 minute. Then, whisk in the rest of the sauce ingredients until smooth. Keep on low heat until ready to use. If desired, place jackfruit pieces on a skewer – 4 per skewer – and place all of the jackfruit in the pan. Cook until golden brown on first side – about 3 minutes – flip, and cook for another 3 minutes or until golden brown. Remove jackfruit pieces to a paper towel to remove excess oil. Drizzle sauce on top of skewers or toss them with the sauce in a large bowl. *Having a grill-out? Marinate the jackfruit, skip the coating in starch part, and grill them on skewers. They’re AMAZING this way. Ahh, thank you so much Karen!